A powerful links. You are encouraged to choose your tees but resist the temptation to go off the backs. It’s a monster even in a slight wind. A fine front nine with a great stretch from the 5th leads to a relatively more sedate back nine. In the early 70’s some far-sighted members identified the links land of the Murvagh Penninsula as being more than suitable for a golf course. 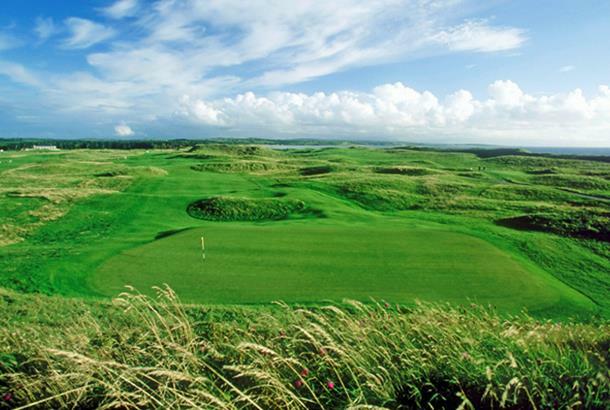 The land was leased from the then Dept of Lands and Ireland ’s leading golf course designer at the time, Eddie Hackett was hired to design an 18-hole golf course on the Murvagh links. The course and new clubhouse was officially opened in 1976. Since then the course has undergone some changes with major remodelling at the 1st, 2nd, 3rd, 9th, 12th,13th,and 14th and the 4th is currently being redeveloped. Most of these changes were carried out under the direction of Mr Pat Ruddy. In 1997 the original clubhouse was demolished and the current structure was officially opened in May 1998. The club and course has in the past hosted the Irish Ladies Close Championship in 1979 and again in 2003. More recently in 2004 the Men’s Irish Close Championship was held here, won by the then European Amateur Champion, Brian McElhinney. Green Fees Mon-Fri €70; Sat-Sun €80.